A beautiful frame in gold faux foil lends a subtle element of tradition to these Gold Frame all in one wedding invitations while remaining stylish and unique. These two-sided invitations are printed with your invitation wording on the front and your choice of wording on the back (reception and wedding website details shown). Matching response postcards are included in the price. Due to the unique printing process required to offer you this invitation and its coordinating pieces at a lower cost, you will personalize the invitation and response card together; however, you will receive the pieces separated. Your wording is printed in your choice of colors and fonts. Inner and outer envelopes are included with these all in one wedding invitations. Size: Invitation: 5 1/8" x 7 1/4", Response Card 5 1/8" x 3 7/8"
Personalization Options: Frame prints in gold faux foil as shown. Your wording is printed in your choice of colors and fonts. Your choice of photo. We were very happy with our purchase. 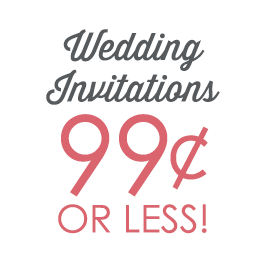 From the wide selection, easy-to-edit interface to the fast shipping, we highly recommend ann's bridal bargains! My soon to be daughter in law ordered these invitations. The description says gold foil and the picture gives the illusion of gold foil as the border. IT IS NOT AS ADVERTISED. THIS COMPANY IS REFUSING TO MAKE THINGS RIGHT!!! Save your money and buy somewhere else with better quality and honest advertising. Customer Service: It is noted in the description that this is faux gold foil. I understand not wanting to supply samples to keep prices down, but if a potential customer is willing to pay for the sample and shipping, it should be provided. You just lost a customer who would have ordered 300 invitations if a sample was allowed to be purchased. YOUR LOSS!!! We are very satisfied with our wedding invitation 3 in 1. They are very nicely printed!!. Arrived on time. I recommend Ann's bridal bargains !! This company is awesome and our invites are beautiful. Can not go wrong with price and this company. We even had to change our time once it was sent, they were able to work with us and get the time changed on the invites before printing. Shipped FAST!!. Would for sure recommend this company to everyone. My fiancé and I are fairly simple people, and we really liked the fact that we could buy all of our invitation materials together. We wanted to focus the majority of our wedding budget on the ceremony and reception, so we decided to go with a cheaper invite option. The quality was great, and we couldn't be happier with how the invites turned out!